Can Arsenal Salvage Their Champions League Hopes? Arsenal crashed back down to reality on Wednesday night when they were at the receiving end of a brutal bludgeoning at the hands of Bayern Munich at the Allianz Arena, sending their Champions League qualification hopes from optimistic to on the verge of falling apart. Having done the unthinkable a fortnight prior, through an extraordinary two-goal victory in front of the raucous Emirates' Stadium support, Pep Guardiola's men got their revenge and more, as the German champions ran riot and put five past a Gunners side who seemed helpless throughout the evening. It leaves Arsene Wenger with a bit of head-scratching to do. Over the past month or so the form of the North Londoners has been exceptional in the Premier League, but now two anomalies have cropped up. Perhaps the first, being pummelled by Sheffield Wednesday in the league cup, can be written off as complacency among a backlog of shocks in the tournament. The other may not hamper their domestic duties either, but their future in Europe is now uncertain. With both Bayern Munich and Olympiacos hovering at the top of Group F with nine points to their name, the margin for error for Arsenal is now almost negligible. They will need to win both their games, but even that may not be enough with them needing to rely on a goal difference hanging on the negative after being smashed by the mighty Bayern. Shared were the hopes from fans to staff that Arsenal's home victory over the Germans was the springboard to getting their European campaign back on track. While the alarm bells should have already been sounding well before they prepared for back-to-back clashes with the juggernauts, the situation is tough; they could end up in the Europa League which will be a huge disappointment, or worse in terms of results, a last-placed finish is still well on the cards. Arsenal are one of the clubs adding to the reasons why the Premier League may not be the best in the world. For entertainment purposes few can rival the English top flight, but the Gunners' inability to translate their quite scintillating form on to a continental scale raises questions of both the club and league's credibility. Making matters worse is the injury crisis that shows no signs of letting up. Hector Bellerin's absence due to a groin injury left the team without the pace in defence that could have stopped some of the blitzing runs down the flank while Oxlade-Chamberlain and Walcott, nursing hamstring and calf injuries, could have helped on the other end. With Ramsey, Arteta, Ospina, Wilshere, Rosicky and Welbeck on the sidelines too, Laurent Koscielny would be added to that total with the return times of the players potentially ruling them out of the North London Derby or for many weeks to come. But even with a mounting pile of injuries, they more than held their own in the league. What is a potential job may now hinge on setting priorities straight: continue battling at the top of the league or make a few risks to strengthen Champions League qualifications. Making balances like that are a hard act, but all the more difficult with the injuries that Arsenal have endured. Whether or not they are capable comes down to that. They have to win the next two Champions League games and even that may not be enough. Is there, however, a greater good involved? After all Wenger's men are flying through the league so maybe this won't be the dreaded fourth-placed finish repeating itself. It's very much a stanza where they must put both feet in the door, which door that is depends on what Wenger's plans are. Let's not forget though that the next instalment to Arsenal's European future is three weeks away. Injuries could be nursed by then, but even with a full strength squad issues could lie deeper. Bayern Munich may or may not have been a class apart from Arsenal in terms of footballing quality. Munich are machines. But for all the investment, they surely should be able to punch at the same weight, not get completely trounced. For them to establish themselves as European elite talent will require a painstaking process and prognosis of why they lost so spectacularly. They need to reflect their Premier League performances into the Champions League. Easier said than done, but they can start with much more intensity and an increased work rate. Joel Campbell and Mesut Özil couldn't fulfil on a defensive effort. Exposing that frailty, Bayern Munich went to the wings much more often and ended up ripping their opposition apart because of it. Bayern love to press, and clearly Arsenal don't, or at least they made it look like that with their reluctance to close down the Germans, which gave David Alaba plenty of time and room to strike into the top corner on the stroke of half-time. In hindsight it was a mismatch on how it played out. Arsenal must be at functioning and full strength, at least an optimised version of that to stand a chance. Their hopes were ignited when beating Bayern, but when they were on the receiving end of a vicious revenge, they are now left to pick up a lot of pieces. Arsenal can qualify, because mathematically it remains in the realms of possibility. But to achieve that extraordinary feat, they'll need luck on their side too. Maybe they're due for some. TheSportMatrix • We Live For Sport: Can Arsenal Salvage Their Champions League Hopes? 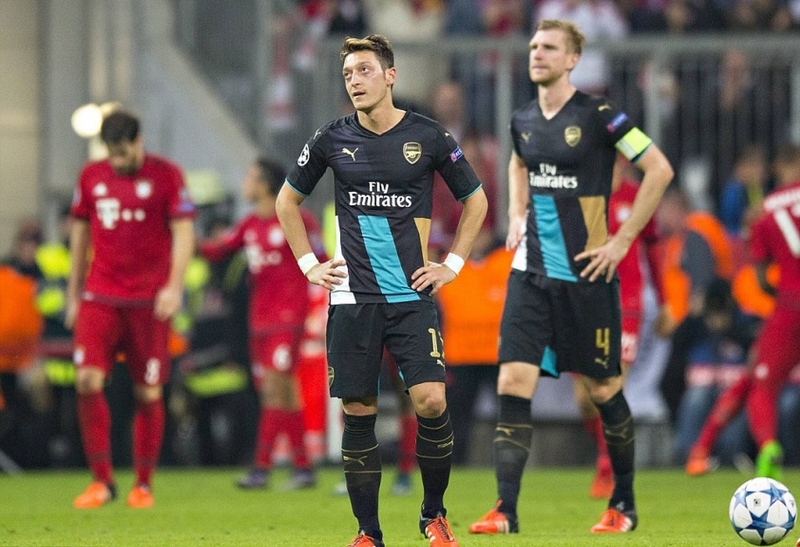 Following being decimated by Bayern Munich 5-1 in the Champions League, can Arsenal still salvage their hopes?